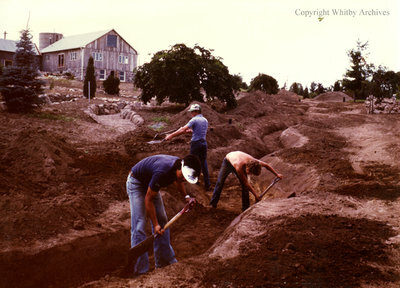 A colour photograph of the digging of the stream bed at Cullen Gardens and Miniature Village. In this view Tom Cullen is at the back of the photograph. Cullen Gardens and Miniature Village, 1979, Photographer Unknown. Whitby Archives A2013_042_097.